You do not need to be a member of Metro Ferret to help our cause by making a donation. 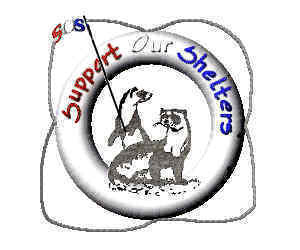 Please help us to help the shelters today! We try to support a variety of shelters in New York and New Jersey, even if they are not officially sponsored by Metro Ferret. A list of our primary shelters is below. For a full listing of ferret shelters, please visit www.ferretcentral.org. All donations are divided between the shelters on a sliding scale basis. Donations will be used to purchase Ferret Food, litter and supplies. Donations are also used to pay for the medical treatment for the shelter ferrets. We do not make any direct cash contributions to the shelters. All funds are used for supplies and veterinary expenses only. Ferret Shelters are always in need of the following: Ferret Food (Totally Ferret, Ferret Store Choice, Zupreem, Ultimate 8-in-1), Supplements (Nutrical, Ferrettone, Ferretvite, Laxatone), Paper Towels in BULK, Cleaning Supplies, Bedding, Carpet samples, hammocks, and homes with lots of love. If you would like to make any type of supply donation, please send it to our address on the home page, and we will see that it is sent to a shelter in need. Thanks! By giving today, you will ensure a better tomorrow for the shelters and the ferrets that they care for! We, and the ferrets thank you!! Joanne is a NY Wildlife Rehabilitator, who also does ferret rescue. She runs a great shelter, and always has ferrets available for adoption. Keith and Evelyn own and operate Father Nature's Ferret Rescue. Yvonne wasthe wonderful Operator of Fuzztek, a shelter that only took ADV Positive ferrets, which are not adoptable. Unfortunately, Yvonne has now closed her doors. Thank you, Yvonne for all that you did for the ferrets. We are sad to report that KiSta Ferret Shelter has now closed it's doors. Kim and Stan were wonderful shelter operators, and are great people. We miss you!!! If you are considering opening a no-kill ferret shelter, please contact us. We will be happy to help set you up and share some successful ideas from other shelters!